The Freesat Electronic Programme Guide has moved from Eutelsat 28A early this morning, as part of the final migration of services from the aging satellite, which has been in orbit since 2001. Other channels affected by the move include news channels France 24 (English) and Bloomberg. With the migration, all services targeting UK and Ireland satellite viewers have now moved to one of three new satellites located at 28 degrees East above the equator. 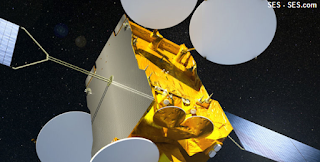 Eutelsat 28A is already a few years over its originally expected 12 year lifespan, and has been associated with spells of poor reception, especially in recent months. Now new satellite Astra 2G has been brought into service, services on 28A have been able to be transferred to either Astra 2E, F, G, with the load being balanced between the three satellites. Services have moved over to Astra 2E, which means viewers in the UK and Ireland will benefit from a stronger, more reliable signal. No action is required by viewers. Viewers in parts of continental Europe will now receive a weaker signal, meaning that it may not be possible to use the full functionality of a Freesat receiver. Generally, viewers who are able to receive BBC and ITV free-to-air services in Europe will continue to be able to receive the Freesat Electronic Programme Guide.